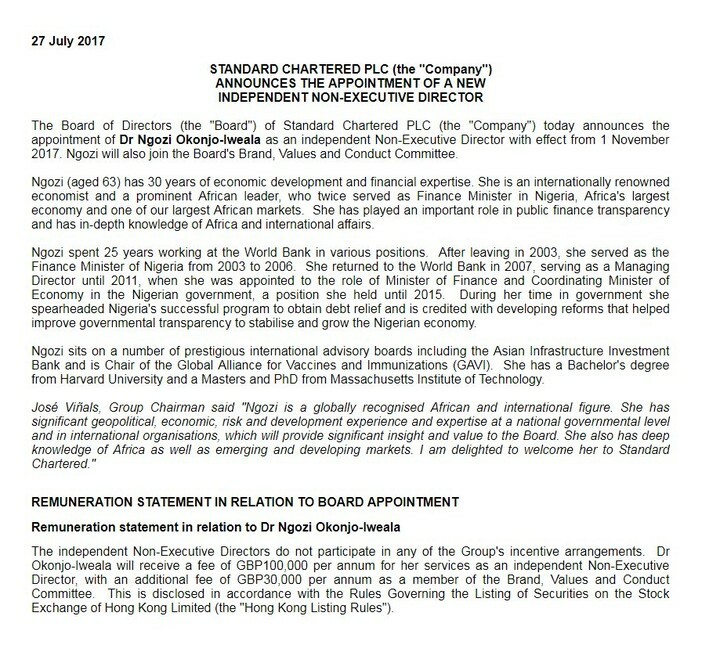 Former Nigeria minister of finance, Ngozi Okonjo-Iweala has been named an independent non-executive director at Standard Chartered PLC. Standard Chartered PLC is a British multinational banking and financial services company headquartered in London, England and with presence in 70 countries. According to a statement released on Thursday, by Jon Tracey, the bank’s media specialist, at the London Stock Exchange, the company said her appointment is effective from November 1, 2017. She will earn £130,000 per annum for her expertise in financial and development financing. “The independent Non-Executive Directors do not participate in any of the Group’s incentive arrangements,” the statement read. “Dr Okonjo-Iweala will receive a fee of GBP100,000 per annum for her services as an independent Non-Executive Director, with an additional fee of GBP30,000 per annum as a member of the Brand, Values and Conduct Committee. This is disclosed in accordance with the Rules Governing the Listing of Securities on the Stock Exchange of Hong Kong Limited”. José Viñals, group chairman said “Ngozi is a globally recognised African and international figure”. “She has significant geopolitical, economic, risk and development experience and expertise at a national governmental level and in international organisations, which will provide significant insight and value to the Board. 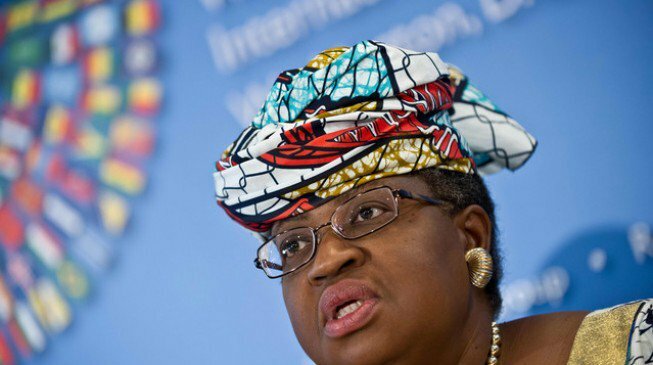 Okonjo-Iweala spent 25 years working at the World Bank in various positions. After leaving in 2003, she served as the finance minister of Nigeria from 2003 to 2006. She returned to the World Bank in 2007, serving as a managing director until 2011, when she was appointed to the role of minister of finance and coordinating minister of economy in Nigeria. According to the bank, Okonjo-Iweala “spearheaded Nigeria’s successful program to obtain debt relief and is credited with developing reforms that helped improve governmental transparency to stabilise and grow the Nigerian economy”. The 63-year-old sits on a number of prestigious international advisory boards including the Asian Infrastructure Investment Bank and is Chair of the Global Alliance for Vaccines and Immunizations (GAVI). She has a Bachelor’s degree from Harvard University and a Masters and PhD from Massachusetts Institute of Technology.